Although Minimalism as an art movement prevailed for a brief period of time in the Sixties, it had a great influence on the art world. Forty years later Minimalism continues to appear in new forms in various media, including ceramics. In this article I will describe several Israeli ceramic artworks that express a contemporary version of Minimalism and I will try to illustrate the unique contribution of ceramics to this movement. The Visual Minimum can be defined as a kind of perfection which an object acquires when it can no longer be improved by subtraction. It is the quality that an object has when each component, every detail, every connection has been reduced or compressed to the essential. Minimalism, however, is a movement in art. Pure Minimalism existed for a brief period of time from 1960-1967. It appeared in the U.S. as a reaction to Abstract Expressionism (see works by Jackson Pollock) that focused on the artists gesture and personality. Minimalist sculpture moved away from figurative representation, rejected any symbolic interpretation and aspired to affect the viewer through its presence. Minimalist sculpture is integral to the space in which it is presented, and therefore it is referred to as site specific (See works by artists Sol Lewitt, Carl Andre and Donald Judd). The interest of the artists was in the “pure shape” and not in the contents. The demand was for material that would impose no limits on the final outcome; hence iron and wood were preferred. A demanding material such as clay, that imposes its physical and chemical attributes, had no place in pure Minimalism .The rigid rules of minimalism, which emphasized surface, shape and mass, were in sharp contrast with ceramic work that values hand-work and the search for unique color and texture. Following pure Minimalism were the Post Minimalists, who were active in the late Sixties and through most of the Seventies. The principle of reduction that characterized Minimalism was expanded and deepened, and new materials and their use were explored (see works by artists Robert Morris, Eva Hesse, Richard Serra). Repetition and rigid geometry were abandoned in favor of personal touch and autobiographical expression. It is not surprising that at this the time ceramics found a voice in this sphere. John Mason is an example of a ceramic artist who made a sharp transition from Abstract Expressionism (he was part of the Peter Voulkos group) to Post-Minimalism. In the series “Hudson River” dated 1978 Mason used industrial bricks, identical objects in an array based on monotonous repetition. This concept was a breakthrough for ceramics moving away from the fundamental idea of pottery being centered, focused and a form of personal expression towards the construction of an arrangement where each element is of equal importance(de Waal, 2003, pp. 184). When examining work made by ceramic artists such as Wouter Dam, Martin Smith and Geert Lap one is faced with the paradox of minimalist ceramics. While Pure Minimalism has criticized expressions of creativity and the artist’s virtuosity, ceramic artworks that are identified with Minimalism are a product of impeccable technical ability. The question that interests me and I am about to examine is what is in the clay that brings an added value to the world of Minimalism? Clay, when compared to iron and wood, is inefficient in conveying indifference. Ceramic art, pure in form and exclusive of fingerprints, will still have the inherent depth of the material itself. If so, what contribution can clay have to an artwork that is founded on the ideology of the Minimalist restraint? The examination of ceramic works by artists associated with Post-Minimalism leads to a conclusion that ceramics, even without the intention of the artist, will always make reference to the human body (see the work of Felicity Ayleff shown in the exhibition “Sense and Perception” , 2001 Manchester Art Gallery). Updated elements of Minimalist principles are expressed by several Israeli ceramic artists who have adopted the mannerisms of restraint and restrictions, while integrating narrative elements. 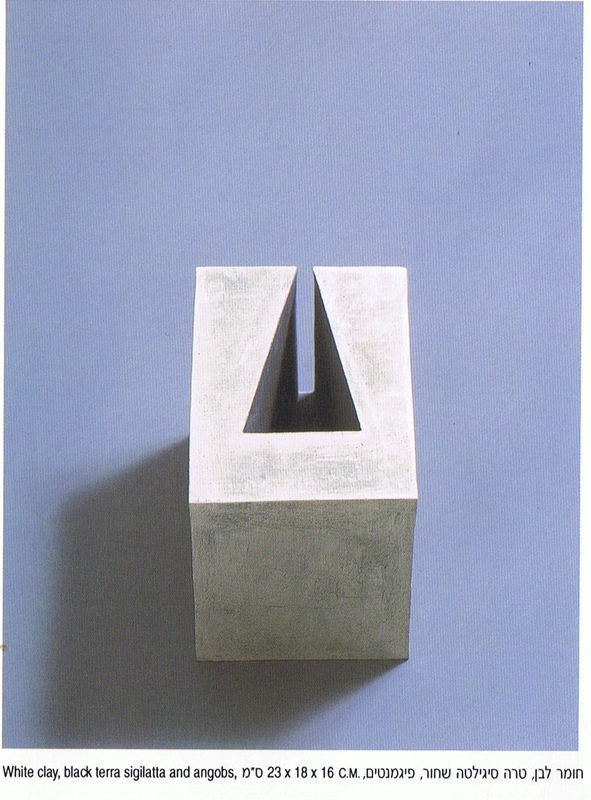 Theorist Gilad Meltzer recognized the return to the principles of Minimalism and Post Minimalism of Israeli artists (see Exhibition catalog “Flat”, Bezalel Gallery Tel Aviv 2007) in the mid-nineties and named it Neo-Post-Minimalism, in which autobiographical elements and personal touch adds a new twist to narrative form. In 2005 ceramic artist Ronit Zor presented an installation of monochromatic geometric shapes constructed from parallel flat slabs. Although the shapes are restrained, the surfaces have fingerprints made by the artist when building the piece and show the evidence of the material limitations which has a tendency to bend in the firing process. The uniformity of the color is broken by the richness inherent in the material. 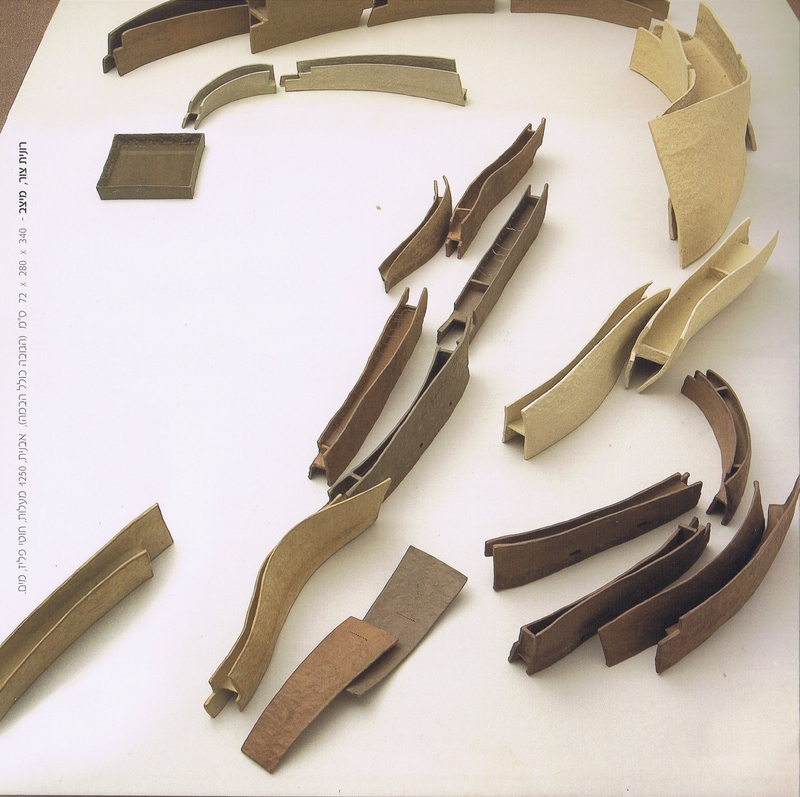 The shape of the objects reminds at the same time the industrial H beam and aqueducts (see Post-Minimal artists Robert Morris L beam installations). Although each segment was relatively small (25X8X8cm), the multiplicity of objects and the way they were arranged in the space creates a scale larger than the human body (340X280X72 cm). The clay in this work conveys the unique character of the material and its close ties with the people and culture of the region. 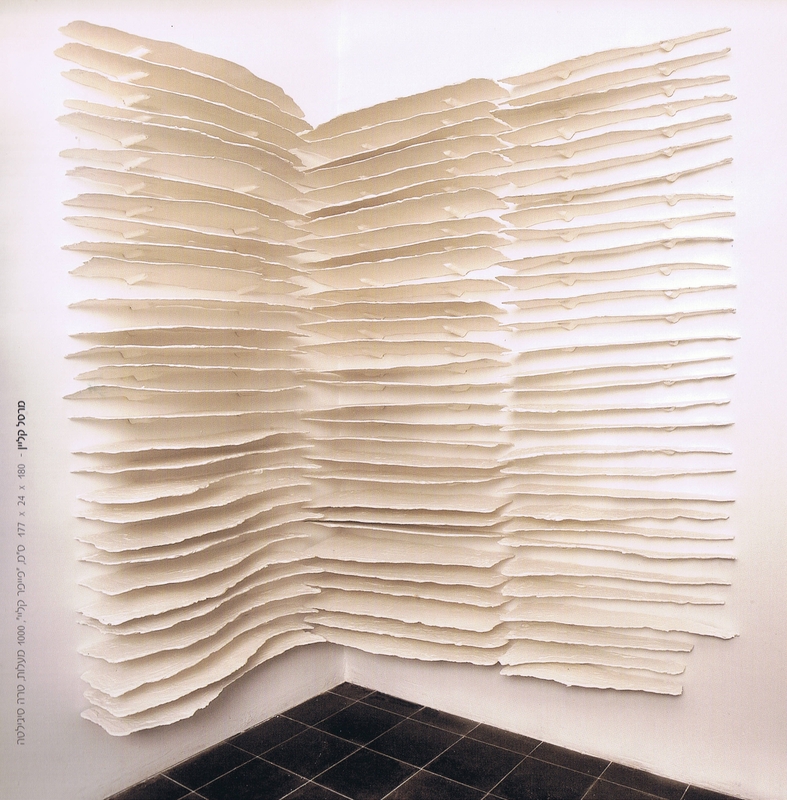 In the same exhibition, ceramic artist Marcelle Klein exhibited a white, monochromatic installation in a corner of the museum. The hand-made paperclay shelves were systematically arranged in layers and hung on the wall. The individual units cannot be defined as “restrained” or characterized by formal geometry. The restrained characterization of Minimalism is in the entire installation, where Klein hung the shelves in a measured and systematic manner. By installing the work in the corner, the artist bridges the gap between two and three dimensions. The sculpted sheets protruding from the flat walls create a third dimension. A corner installation, by nature, takes into account the architectural specifications of the room and significantly alters the organization of space. The clay broadens the interpretation of the work and adds organic resonance associated to geology and nature, i.e. adds the story of erosion. Anat Barel is another artist that focuses on the reduction of shape. In 1995 Barel presented a series of objects called “Slice of Llight”. The elements were white, three-dimensional geometric structures pierced by a cut which was colored. Barel focuses on the shape and generally neutralizes the traces of her touch. Once again these geometric objects and the ceramic material lead one to consider the cultural context. One of the elements in “Slice of Light” is a thick sliced box (23X18X16 cm), the inside walls painted light blue. A fairly simple object, which demonstrates the special energy that clay can generate, different from other materials. In addition, the seemingly simple ceramic structure reminds one of the strong connections between pottery and architecture, namely houses from clay (adobe). Those houses hold information disguised by the meticulous working and polishing of the material that at the same time exposes the existence of the human touch. In all the artworks that I have mentioned, the clay has added the narrative aspect due to its special character, nature and historical significance. The works examine issues of form and volume which retain a basic geometric shape with clean lines and precise surfaces, but at the same time add a discussion about the limitations of formality, the mediums materiality and its historical baggage. By doing so, they expose the artworks inability to refrain from the narrative. De Waal, Edmund, 2003, , 20th Century Ceramics, Thames & Hudson world of art. Del Vecchio, Mark, 2001, Postmodern Ceramics, Thames & Hudson, London. Meltzer, Gilad, 2007, The face of things, from the exhibition catalog “Flat”, Bezalel Gallery, Tel Aviv.